The Leonis Adobe is the Calabasas home of Miguel Leonis, one of the most colorful and larger-than-life figures in 19th century Los Angeles. Standing six-feet-four-inches tall and referred to as the "King of Calabasas," Leonis was a wealthy French Basque rancho owner in the San Fernando Valley. Unable to read and write but gifted with shrewd business acumen, Leonis was relentless in land acquisition, claiming almost 11,000 acres across the valley at the height of his power. His domain also included property in downtown Los Angeles, Santa Barbara, and Elizabeth Lake. Leonis was known for forcefully protecting his land against squatters, often employing a small army of Indians and Mexicans. Don Miguel was regarded as an intimidating and litigious land usurper but was also respected as a gentleman farmer and sheep rancher. Born in c. 1822 in Cambo les Bains, a Basque province in southwest France, Leonis arrived in Los Angeles in 1854. He was part of the wave of French-speaking immigrants, primarily Basques, who settled in the area in the mid-1800s. He quickly found work in the San Fernando Valley as a sheep herder, ultimately becoming foreman at Rancho El Escorpion-present day West Hills, Woodland Hills, and Calabasas. Leonis met his wife on El Escorpion in 1859; but contrary to Basque custom, his wife, Espiritu Chijulla, was a Chumash Indian. When Leonis first acquired the Adobe property, historical notations suggest that an abandoned adobe brick structure from c. 1844 sat on the site. 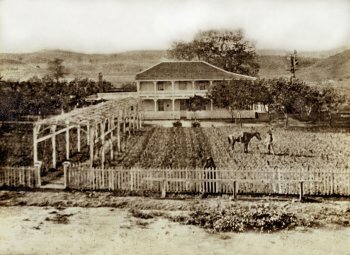 During the 1870s, Miguel and Espiritu moved into the home you see today. The home is constructed of adobe bricks, a common building material used in the region during the period. Miguel had it built as a two-story dwelling with a wrap around veranda, known nowadays as the California Monterey Style. He added traditional wood cladding to both the home's exterior and to several interior rooms. The house is adorned with various architectural elements, including Victorian fretwork along the balcony. Several years later, he fully enclosed the rear and northeast portions of the veranda in order to build more interior spaces on both floors. Presumably chosen by Leonis, the original colors of the house were discovered under many layers of paint. Today, family portraits still hang in their original positions on the living room walls. Discovered in pieces and restored, the large living room mirror hanging next to the front door previously hung where the dining room doors are now. The dining room access doors were a 1920s addition. In keeping with Victorian architectural standards, the present day living room was originally two distinct rooms: a parlor and a sitting room. 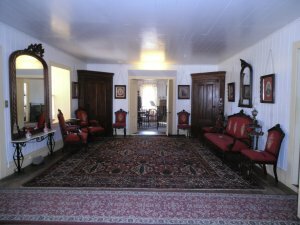 The removal of the wall between the two rooms also took place in the 1920s.The parlor was a formal room where guests were received and the sitting area was a personal space where Espiritu was known to take siestas or midday naps. During the Adobe's meticulous restoration in the 1960s, the wall was never replaced in order to accommodate large groups of visitors. Originally slated for demolition, the Leonis Adobe survives today primarily because of the efforts of a local community activist named Kay Beachy. She recognized the importance of historic preservation early on and spearheaded the official formation of the Los Angeles Cultural Heritage Board. Within hours of the Board's first meeting on August 6, 1962, the Leonis Adobe was designated Los Angeles Historic-Cultural Monument #1and saved from the wrecking ball. Today, only a small portion of the property remains, much of it sold off over the years. In fact, the existing barn, built in 1912, was moved twice to accommodate the 101 Freeway. In 1889, Miguel Leonis died in a wagon accident while traveling to downtown Los Angeles over the Cahuenga Pass. He was thrown from his wagon, which was heavily loaded with firewood, and crushed underneath its wheels. Despite a 30-year common-law marriage to Espiritu, Leonis willed the majority of his assets to relatives in France. Espiritu challenged the estate in court, a highly unusual step for a Chumash Indian woman in the 19th century. After a 16-year protracted legal battle, and just seven months before her death in 1906, Espiritu won her case.